I have visited the Petersen Automotive Museum’s newest gallery exhibit, and it is an eye opening view into the worlds of custom and pop culture. It’s small but mighty, staged in one of the Petersen’s smaller gallery halls but packed to the gills with interesting content. It’s a highly eclectic gathering of wall art, sculpture, and cars; back in the 60s some would have called it beatnik or progressive or funky or far out. It is all of those plus maybe avant guard, and I’d even add hipster. 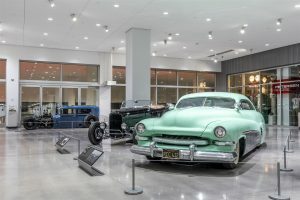 Something for everyone here, you may or may not love it all, but lots and lots to look at. 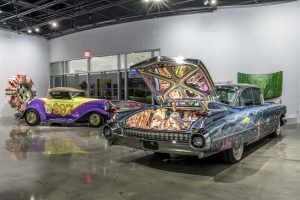 At left, Ed Big Daddy Roth’s incomparable Orbitron show rod, and Von Dutch’s Kenford truck, which is of course an old Kenworth truck body on a Ford pickup chassis. Because he could! 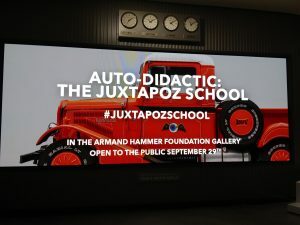 Titled “Auto-Didactic: The Juxtapoz School,” the new exhibition displays the work of artists from the pages of the famed underground culture magazine who have continually reconceptualized the role and imagery of automobiles in contemporary art. 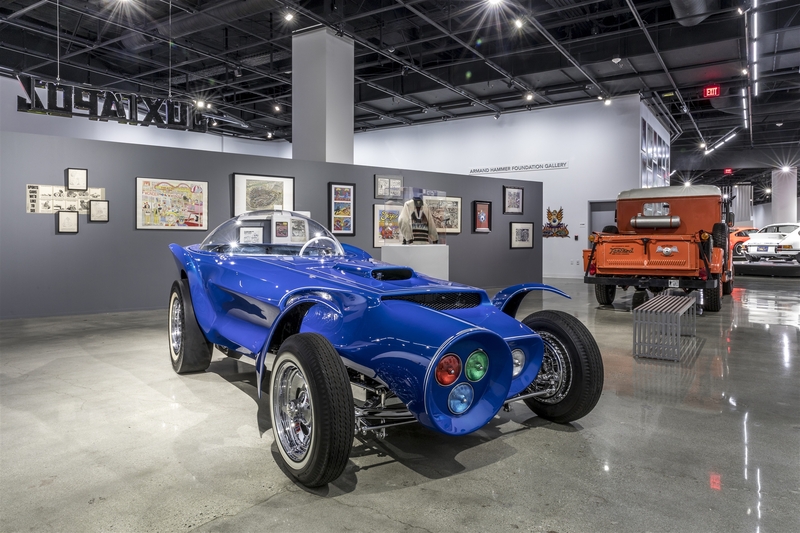 On Saturday, September 29, 2018, the Petersen Automotive Museum unveiled the first in a series of “California-themed” exhibititions to kick off its 25th anniversary in 2019. 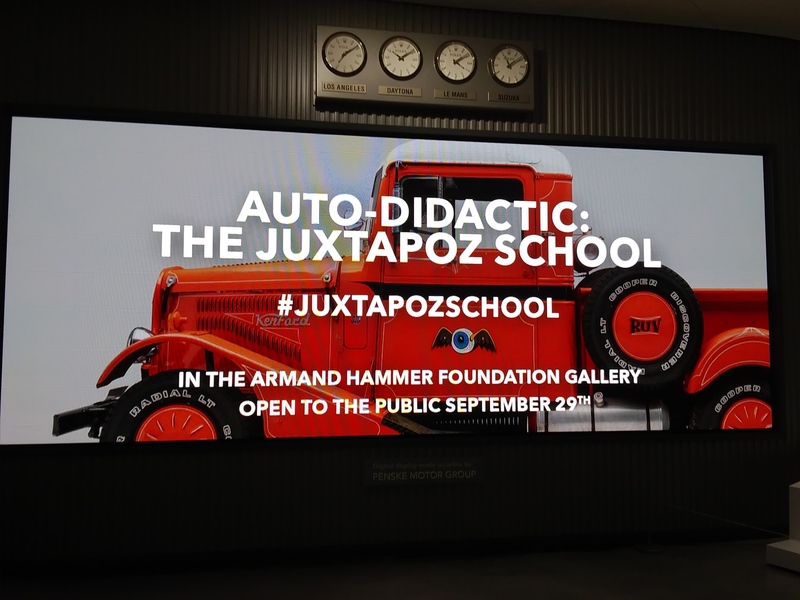 Titled “Auto-Didactic: The Juxtapoz School,” the display examines a mix of art pieces and automobiles from the artists of Juxtapoz Magazine, who have helped redefine the role and imagery of automobiles in contemporary art. 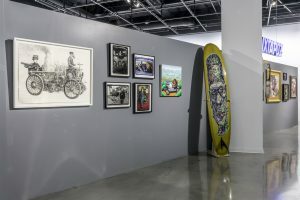 Replacing “The High Art of Riding Low: Ranflas, Corazón e Inspiración” exhibit in the Armand Hammer Foundation Gallery, “Auto-Didactic” features more than 50 artists. Artists on display include skateboarder, designer and OBEY Clothing Founder Shepard Fairey; famous pinstriper of the “Kustom Kulture” movement Von Dutch; and painter, cartoonist and “Juxtapoz Magazine” founder himself Robert Williams. New Improved Ultima Suprema Deluxa. 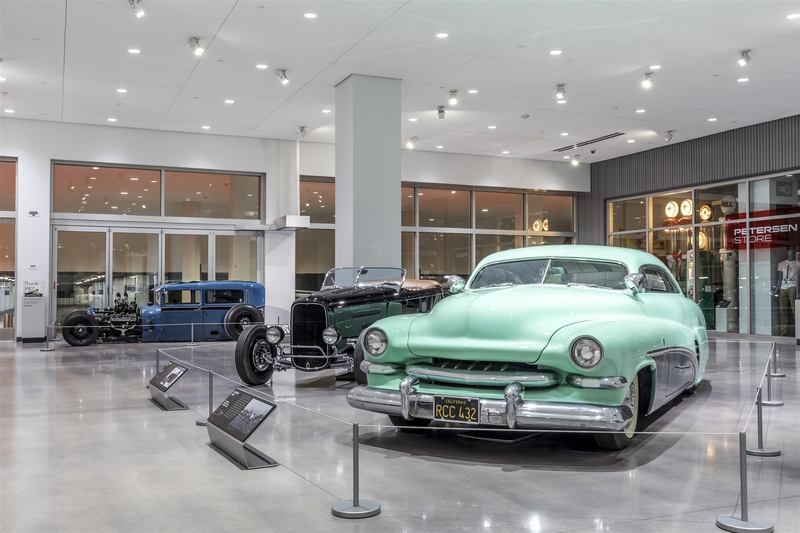 The ’32 Ford rod is nicknamed Prickly Heat, designed, built and owned by Juxtapose magazine’s Robert Williams. 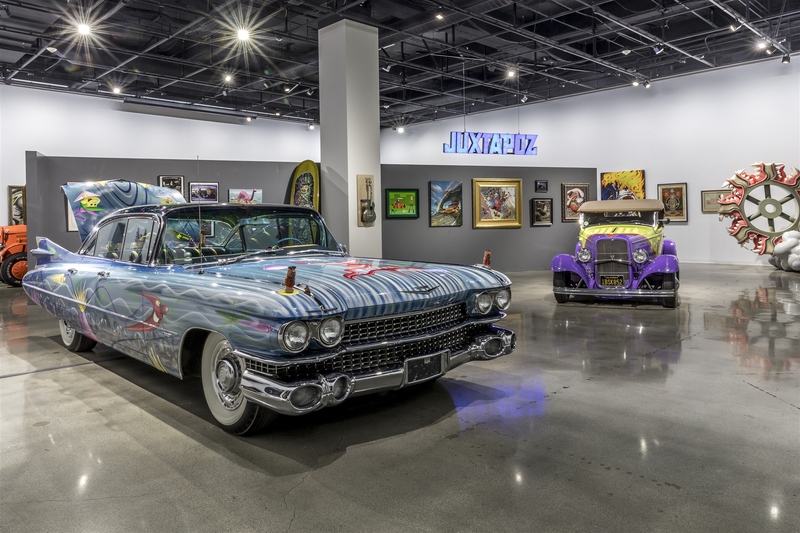 In addition to the selection of art pieces, the exhibition highlights notable art cars including the 1932 Ford Roadster named “Prickly Heat” by Robert Williams, “The Orbiton” by Ed “Big Daddy” Roth, “The Kenford Truck” by Von Dutch and the 1959 Cadillac titled “The New and Improved Ultima Suprema Deluxa” by Kenny Scharf. 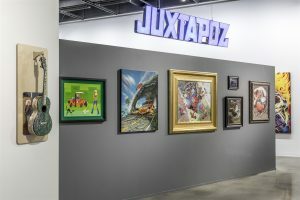 Launched with the mission of connecting subculture genres such as psychedelic posters, hot rod art, street art and illustration with traditional “highbrow” mediums, “Juxtapoz Magazine” was founded in 1994. 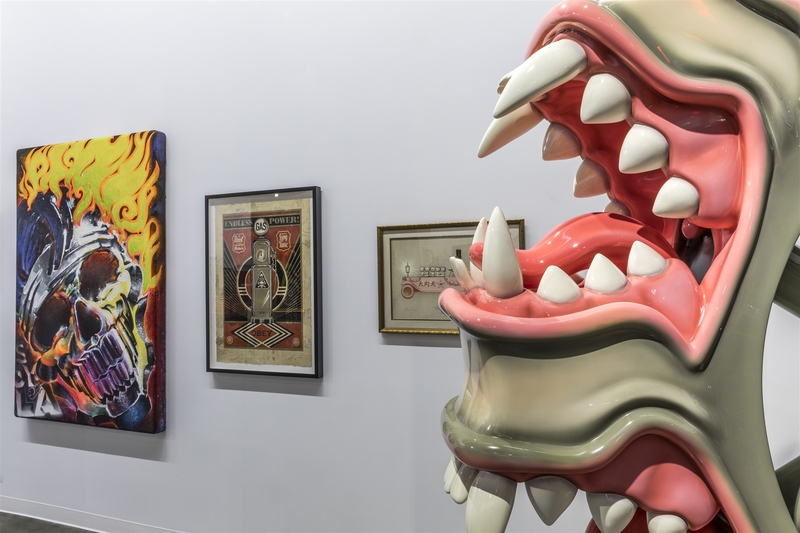 Since its inception, the magazine has continuously addressed themes deemed “unsavory” by many staunch art critics. 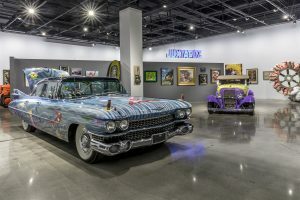 It was not until the Laguna Art Museum’s presented its “Kustom Kulture” exhibition in 1993 that the relative interests of underground artists and collectors were presented as a unified group, paving the way for the creation of the magazine.